Great fishing once again looms just around the corner, or at least, it does if you believe the solunar fishing tables. Available from many different sources, we will occasionally check in with the Best Fishing Times Charts from In-Fisherman. The latest glance at the fishing charts indicates that the best fishing will be occurring this next week during the full moon. This is terrible timing because of final exams that are scheduled for the first half of the week. Thankfully, I'm done with the last one by noon on Wednesday and after that, it will be out to the stream for me!!! As summer approaches, the realization that my trip west is approaching has me scouring the Internet for any and all information on the Montana and Wyoming areas. I enjoy keeping track of the fishing Journal at Blue Ribbon Flies in West Yellowstone just to see what they have been catching and what works at various times of the year. The Dakota Angler & Outfitter maintains a fishing report as well that I check from time to time. 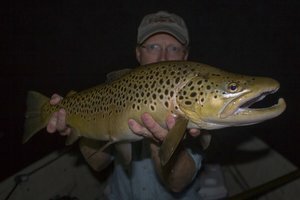 Western South Dakota really has some excellent fishing and is a must-fish stop for me when heading to the Yellowstone area. The latest word from the Billings Gazette in Montana appears to indicate the the Mother's Day Caddis are starting on the Yellowstone River. Rumors have been floating around of good numbers of caddis showing on the famed Arkansas River in Colorado as well. Of course, this leaves me wondering why I chose to head west at the hottest and most crowded time of the summer. 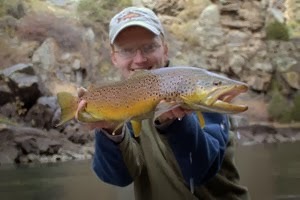 Some of my best fishing in western South Dakota has been during early May to mid June. The early season in Yellowstone National Park can be an experience as well. The Firehole is often one of the best options for early season fishing in the park and it provides reliable hatches of BWOs, PMDs and evening caddis. The early season can be a hazardous time to plan a trip around however. Depending on runoff, most western rivers will be high and dirty at best and quite possibly downright unfishable. 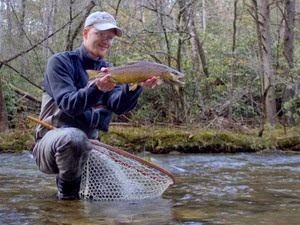 If you time it right however, early season fishing can be among the best of the year as the crowds are nowhere to be seen and big trout hungrily feast on the bounty of spring. 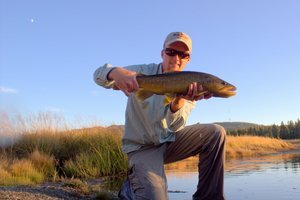 This can be the best time to fish the high country lakes throughout the Rockies. The expert stillwater fisherman will generally all tell you that the time for large fish is either soon after ice-out or in the late fall just before everything freezes. Some of my best early spring memories involve high country lakes. From Apache trout in Arizona to Grayling in Yellowstone, the early season often provides non-stop action for the adventuresome angler. This past weekend I was home visiting the family so I had to fish the Caney on Sunday. I arrived at the river and noticed that there was not a lot of activity, at least where I first took a gander. However, upriver there seemed to be a few fish working. The dry with a zebra midge came out and I was soon casting, covering the usual places without any results. "The fish must be holding in deeper water" I thought. As low as the water levels were, this made perfect sense. I moved up to some deeper holes and soon hooked up...and then again, and again, and again....it was one of those days where it seems you can't do any wrong. 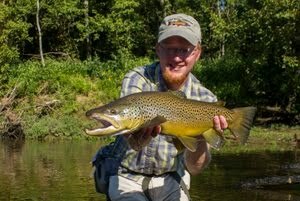 Lots of very healthy 12-16 inch fish were attacking my fly consistently, often as soon as it hit the water. I moved 3-4 large fish (18-20 inches) but couldn't get a solid hookup. Later in the day, the generation pulse caught up with me and I decided to try my hand at ripping streamers (something I never do). This proved to be the ticket as the brownies all wanted to play. One monster swirled on my fly but wouldn't hit again. I called it a day soon after having lost caught how many fish I hooked. Hopefully I will find the time to return sometime soon with my canoe. I can only imagine how many good fish could be caught floating the pulse and flinging heavy stuff. In other more exciting news, I have a new camera on the way. It is waterproof and will hopefully allow some excellent underwater pictures to be available for use on this blog. I should have it in a couple of weeks at most so stay tuned for some great new pictures!! !